The first animal model for ALS dementia has been developed. The first animal model for ALS dementia, a form of ALS that also damages the brain, has been developed by Northwestern Medicine scientists. The advance will allow researchers to directly see the brains of living mice, under anesthesia, at the microscopic level. This will allow direct monitoring of test drugs to determine if they work. This is one of the latest research findings since the ALS Ice Bucket Challenge heightened interest in the disease and the need for expanded research and funding. This new model will allow rapid testing and direct monitoring of drugs in real time and will allow scientists to move quickly and accelerate the testing of drug therapies. The new mouse model has the pathological hallmarks of the disease in humans with mutations in the genes for UBQLN2 (ubliqulin 2) and SQSTM1 (P62) that the team identified in 2011. That pathology was linked to all forms of ALS and ALS/dementia. In the current study, published in the Proceedings of the National Academy of Sciences, behavioural, neurophysiological and pathological changes in a mouse that mimic this form of dementia associated with ALS (amyotrophic lateral sclerosis) have been reproduced. Five percent or more of ALS cases, also known as Lou Gehrig’s Disease, also have ALS/dementia. ALS with dementia is an even more vicious disease than ALS alone because it attacks the brain causing changes in behaviour and language well as paralysis. ALS affects an estimated 350,000 people worldwide, with an average survival of three years. In this progressive neurological disorder, the degeneration of neurons leads to muscle weakness and impaired speaking, swallowing and breathing, eventually causing paralysis and death. The associated dementia affects behavior and may affect decision-making, judgment, insight and language. It’s been difficult for scientists to reproduce the genetic mutations of ALS, especially ALS/dementia in animal models, which has hampered drug therapy testing. With this new model it is hoped that this will no longer be the case. 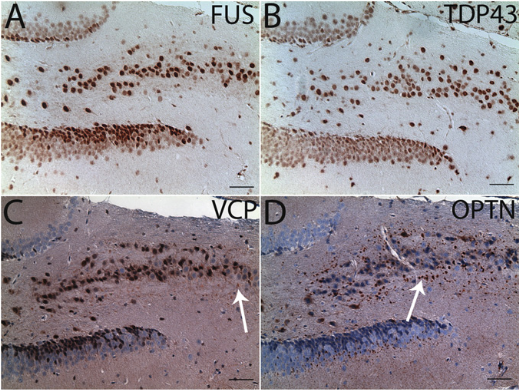 ALS- and frontotemporal dementia (FTD)-associated proteins in transgenic mice. Immonohistochemtry (A–D) and confocal microscopy. Relatively weak VCP- and strong OPTN-immunoreactive aggregates were present in the hippocampus (C and D, indicated by arrows). Hematoxylin was not used for FUS (A) and TDP43 (B) immunohistochemistry to avoid masking nuclear staining of these two proteins. Dendritic spinopathy in transgenic mice expressing ALS/dementia-linked mutant UBQLN2. Siddique et al 2014. Really interesting topic , thanks for posting .